different figures: Ernest Hemingway and José Martí. Both of these men are widely adored by the Cuban people and for good reason. They have deep-rooted history in Cuba, and left a long-lasting legacy behind them. Yet, as Americans, we only ever heard of Hemingway. 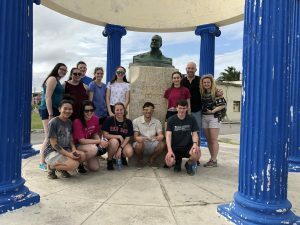 How was it that throughout our lives and lengthy backgrounds of education, not a single person in our group of twelve had as much as heard Jose Marti’s name? The answer is unclear, but the fact still remains: the United States needs a little brushing up on José Martí. Well, actually, the United States needs a little brushing up on all of Latin America. For today, though, we can start with Cuba. Ernest Hemingway is the better known of the two icons I saw around Havana. He is a renowned author, born in the U.S, but famous in Cuba because of the time he spent living there. His favorite bars have become local hot spots, and his house was turned into a museum. There are plenty of statues in his honor, and street art created in his image. 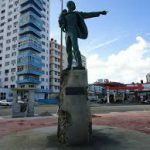 The locals loved him, and he is especially popular in the young baseball community because he helped to create the first ever youth baseball league in Cuba. Even many of his writings take place in Cuba; in fact, the novel “The Old Man and the Sea” is based on a real-life Cuban fisherman. 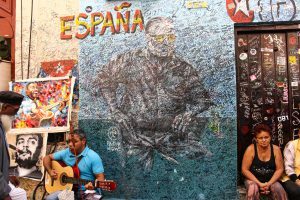 His legacy shows absolutely no sign of disappearing from the every day life of a Cuban citizen. Even more engrained in their culture is José Martí. Martí is quite literally part of almost every home in Cuba. While walking down any residential street you will see a bust of Martí, with his distinctive mustache, in front of any given house. But who is he? The answer is many things: a poet, a writer, a professor, a politician, a militiaman, a revolutionary leader, and a patriot for independence. Starting at merely fifteen years old, Martí dedicated his life to revolutionizing Cuba. He fought for his ideals, with an emphasis on independence and racial equality. Martí spent a lot of his life living in various countries, most of which were in Latin America, but he also lived in the U.S., too. There, he worked as a writer and created his famous essay titled “Our America.” This is what shocks me most about Martí: he lived in the U.S., and I still had never heard of him. His contributions to the indolence movement in Cuba, combined with his inspirational writings, have made him a national hero. He can be seen in statues or busts, artwork, and a whole school dedicated to his teachings. Together, these figures make up the two most prevalent icons in Cuban culture that I was able to witness. 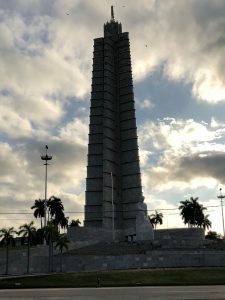 I was glad to become educated on the life and writings of José Martí, as well as learn more about Hemingway, an author I had previously read. Cuba is one of our closest neighbors, yet they are so foreign to us. I hope one day there is more education on Latin America in the U.S school systems, and that more people are able to identify more than just Fidel or Che when thinking of famous Cubans.